Imagine what it would be like to never see the sun. In the Norwegian town of Rjukan, that’s exactly what life is like six months out of the year. Located in a valley, because of the high mountains that surround the town, from September to March there is no sunlight. But this year, that will change. At the end of October, the town will install three giant sun mirrors, in order to reflect sun into the town square, bringing sunlight in the middle of the winter for the first time to the town’s 3,000 inhabitants.The idea for a sun mirror was born a century ago when local businessman Sam Eyde had the idea to give access to the sun to his workers. While the sun mirror didn’t get constructed, a gondola was built to take Rjukan’s up to the top of the mountains where they could get some sunlight during the winter. But now thanks to technology, Eyde’s original idea will become a reality, and the the sun mirrors will be launched on October 31, the exact day 100 years ago that the idea was presented in the local newspaper. Well at least global warming is good for something. The rise in Earth’s temperature is making snow lines and glaciers recede on mountain ranges all over the world. While this is a worrying trend, it’s revealing hidden bits of history to archaeologists. In Norway, the receding Lendbreen glacier at 6,560 feet above the sea level has revealed an ancient wool sweater dating to the Iron Age. Carbon dating has revealed that it’s 1,700 years old. It was made of sheep and lamb’s wool in a diamond twill, and was well-worn and patched from heavy use. The Norwegian research team estimates that the person who wore it would have been about 5 feet, 9 inches tall. The results of the study have recently been published in the journal Antiquity. This isn’t the first discovery thanks to receding glaciers. The most famous, of course, is the so-called “Iceman”, a well-preserved corpse of a man who died in the Alps around 3300 BC. Last year we reported the discovery of the bodies of soldiers from World War One in the Alps. in Norway, about 50 textile fragments have been recovered in recent years, although the sweater is the first complete garment. Most discoveries have been accidental, with hikers and mountaineers reporting their finds to the appropriate authorities. In the Iceman’s case, people originally wondered if the well-preserved body might have been a recent murder victim! So if you’re hiking near a melting glacier, keep an eye out for ancient artifacts and bodies, and remember that it’s illegal to pocket them. Do science a favor and call a park ranger. A hundred and twenty years ago, Norwegian scientist Fridtjof Nansen started a journey that made him one of the greatest explorers of all time. He set out to purposely get his ship frozen in the polar ice. The reason? To study polar currents. His ship, the Fram, was purpose-built for the task. It needed to be; many crews had perished in the far north when their ships got frozen and then crushed by ice. The Fram spent three years stuck in the ice as the crew studied currents, took soundings and gathered a host of other scientific data that researchers are still sifting through. Not content with this adventure, Nansen set off on skis in a failed bid to be the first to the North Pole. Nansen (1861-1930) was fascinated with the world of the Arctic. He was the first to ski across Greenland in 1888 and wrote about his adventures in The First Crossing of Greenland. This was the first of many exciting travel books he’d write. His most famous is Farthest North, his account of the Fram expedition. Nansen went on to win the Nobel Peace Prize for his work helping refugees after World War I, including the many victims of the Armenian Genocide. His ship is preserved at The Fram Museum in Oslo. Now researchers at the Norwegian Polar Institute want to get their own ship frozen in the ice. They’re hoping to take an old Arctic research vessel that’s slated for the scrapyard and get it stuck in the ice during the winter of 2014-15. They plan on studying the conditions of the ice, conditions that have changed markedly in the past few years. With the warming of the poles, most ice is only a year old, instead of being several years old like the ice that Nansen studied. This young ice is thinner, more saline, and has different reflective properties than older ice. Such a study may yield important data on how the Arctic is changing due to global warming. You can read more about Nansen and the proposed project in an excellent two-part series on Science Nordic. Launched in 1956, Eurovision is a Europe-wide music competition held every May under the auspices of the European Broadcasting Union (EBU). Participating countries select their representative songs over the course of the preceding winter and spring. Some countries – like Sweden – make their selections via televised heats held over several consecutive weeks. Others – like the U.K. (this year, at least) – make their selections by internal committee. Eurovision is a major event in Europe, with a remarkable 125 million viewers. Nowadays, Eurovision lasts for almost an entire week. With the end of the Cold War and the dissolution of the Soviet Union, there are now so many participating countries – 39 this year; even more in recent years – that two semi-finals are required to winnow down contestants to a manageable tally for the grand final. After semifinals on Tuesday and Thursday, this year’s final will be held later today in Malmö, Sweden. (Sweden won Eurovision last year, and with its win came the right to host this year’s contest. )Eurovision is not generally considered to be a showcase for serious music, and few global stars emerge from it. One very notable exception is ABBA, who turned their 1974 win with “Waterloo” into enormous international success. In lieu of musical seriousness, the event unleashes a kind low-impact skirmish of muted patriotisms and a massive gay following. For many countries, participation in Eurovision is a rite of passage, a sign of progress. An Israeli friend once told me that in the late 1970s her family would dress up to watch Eurovision in their living room. This symbolic appeal of Eurovision remains especially strong in some Eastern European countries and the Caucasus today. All members of the European Broadcasting Union can participate in Eurovision. This fact explains Israel‘s participation. Other EBU members beyond the borders of Europe include Morocco (who participated just once, in 1980) and several countries that have never participated: Algeria, Jordan, Egypt, Lebanon and Tunisia. True Eurovision nerds will tell you that Kazakhstan, Kosovo and Liechtenstein have all submitted applications for EBU membership. So right, tonight. The odds have Denmark‘s Emmelie de Forest, Norway‘s Margaret Berger (with likely the strongest straight-up pop song, a little piece of driven magic titled “I Feed You My Love”), Ukraine‘s Zlata Ognevich, Azerbaijan‘s Farid Mammadov and Russia‘s Dina Garipova at the top of the pile. In addition to these, Hungary, Romania and Greece have emerged as fan favorites. ByeAlex, the Hungarian entrant, sings a lush, quietly earnest song called “Kedvesem.” The singer looks like a quiet, earnest Mission District hipster; he distinguished himself in the press conference for the second semi-final winners on Thursday night by quoting Friedrich Nietzsche. Romania’s entry, sung by a countertenor opera singer named Cezar, is an instant Eurovision dance classic with a particularly over-the-top choreography. The Greek entry, by Koza Mostra featuring rebetiko singer Agathonas Iakovidis, combines folk, punk and rebetiko themes. For those who follow Eurovision obsessively, the event itself is a kind of quasi-religious experience. The line between fandom and evangelism is imprecise for this tribe, many of whom attend Eurovision regularly. This week in Malmö, the Eurovision tribe is everywhere, sharing the gospel of playful but somehow meaningful pop music. The photo above, taken yesterday, gets at some of the gospel’s magic. It’s simple and interpersonal. Koza Mostra’s lead singer, Elias Kozas, has swapped flags with a German Eurovision fan. No negotiations. No conflict. No international frustrations. Just a snapshot of a moment within which flags don’t matter much. The idea of “adventure travel” is hot and those who sell travel know it. Travelers who lead an active lifestyle as a big part of their everyday life want to continue that focus when traveling. Local adventurers who might camp, hike, hunt, ski or bike around where they live, want the thrill of doing that in an amazing place somewhere else on the planet. Even travelers once satisfied with a pre-packaged land tour or the standard fare on a Caribbean cruise want more. Only one problem: not everyone who likes the idea of adventure travel is equipped to handle it. But they still want it. Enter land tour operator Abercrombie and Kent, known for safe and luxurious safari-like travel packages with a hefty price tag. Offering more than a lazy man’s adventure, Abercrombie and Kent (A&K) recently announced a 2014 lineup of cruises to the Arctic. These luxury versions of the frigid expedition sailings for hearty explorers, normally associated with that part of the world, might very well be just what the pseudo-adventure traveler has in mind too. On their July 29, 2014, sailing – Arctic Cruise Norway: Polar Bears & Midnight Sun – A&K guides take their guests to see polar bears, walrus and reindeer from the northern shores of Norway to the Svalbard Archipelago and Spitsbergen (AKA the last stop before the North pole), setting foot on the coastal city of Tromsø and the polar bear stomping grounds of Nordaustlandet. 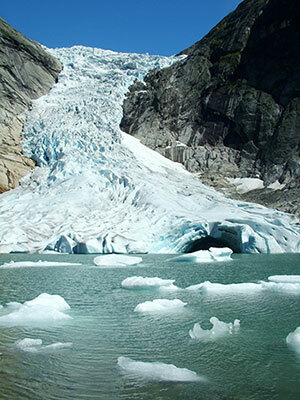 The 12-day adventure starts at $8,995.Another choice – A&K’s Arctic Cruise Adventure: Norway, Greenland & Iceland (Aug 7-21, 2014) – boasts stunning wildlife, geological features and history on an intense 15-day Arctic voyage from Norway and Spitsbergen to the region’s most remote and magnificent islands. Visiting polar bears on the Svalbard archipelago, Kejser Franz Joseph Fjords and Scoresby Sound in Greenland along with Iceland’s extinct Snaefellsjokull volcano among other stops is not a cheap swing around the Caribbean. This one will run you $11,995.